Malgré que la migration n’est pas complété, l’équipe French Marketing aime bien la nouvelle interface ! Dans l’ancienne version de Google Search Console il suffisait de cocher les cases et chacune de ces dimensions s’ajoutait à la liste de requête. 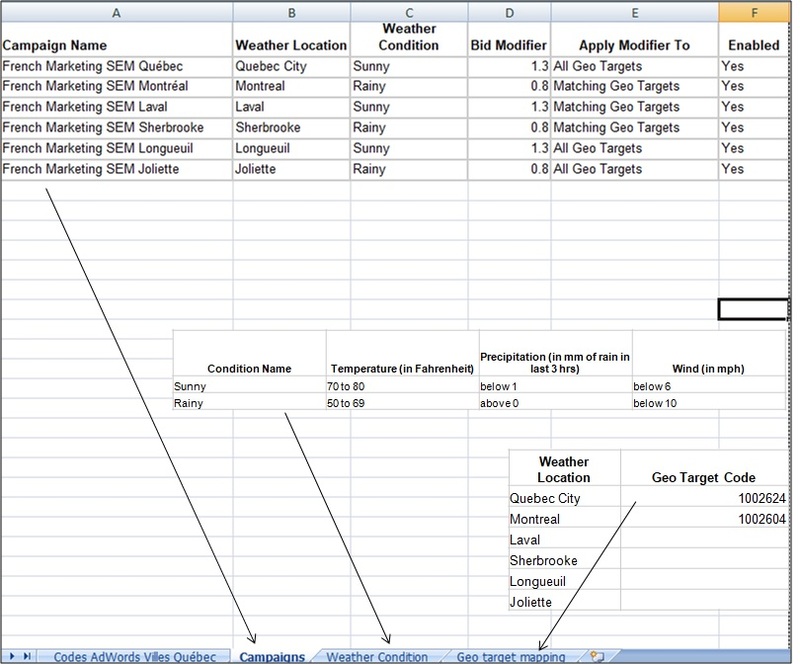 À première vue nous ne trouvions pas comment activer cette recherche jusqu’à ce que nous ayons trouvé les cases colorées au dessus du tableau. La solution est simple et intuitive car la nouvelle interface est très semblable à l’ancienne. Il s’agit maintenant d’activer une case colorée au lieu de cocher la case. 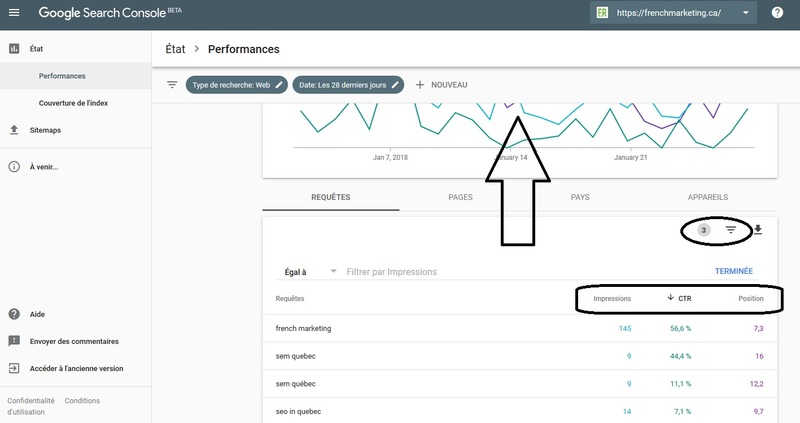 Si vous n’analysez pas déjà votre positionnement organique, il y a une section dans Google Search Console qui exige votre attention et qui vous aidera grandement à améliorer votre performance. Vous trouverez les recherches mots-clés sur Google dans la section Performance > Requêtes, vous pouvez même y ajouter votre position et comparer votre performance sur une période de 28 jours.Veuillez noter que vous trouverez ces infos dans Google Analytiques aussi dans la section Acquisition > Search Console > Requêtes. La météo a une influence importante sur nos décisions et les consommateurs au Québec ne font pas exception à cette règle. Pourtant peu de marques profitent du Marketing basé sur la météo au Québec. Voici la liste des 239 villes dans la base de Google afin d’identifier votre Criteria ID et activer votre campagne SEM basée sur la météo. French Display Networks in Quebec – 1/2 CPM Pricing for French? Should Quebec have a 1/2 CPM Pricing for French? The short answer is No. Obviously you still get a total of 1000 impressions for your Ad bid investment but the exposure and reach is halved in some cases. Of course Quebec should not have a 1/2 CPM Pricing but as explained in earlier articles, Quebec represents a challenge in French Marketing because the audience is smaller. That does not mean you have to tolerate getting less than your money’s worth. The purpose of this article is to explain that there are display networks that can provide low CPM but think about it carefully because Quality may suffer. French Marketing recommends seeking out high quality premium display networks in French for Quebec. Let’s face it if you only use discounted display inventory there is a risk that you may end up with half the value for your CPM campaigns. When two big boxes 300X250, or any same Ad format for that matter unless willfully and purposefully taking over the page, appear side by side you are not getting what you paid for even if the Ads appear above the fold. Consider that the failure is not only the Ads being displayed two times at once, the bigger problem is targeting. Notice that these Ads appear in French however the page was configured for an English viewer. Even worse, the context of this search is for a translation from Russian to English. How did French Ads end up here? The wrong settings have been used in retargeting. Contact us for more details about Display Campaigns in Quebec! Nous avons reçu une question d’un lecteur récemment concernant le potentiel du marketing en français en allemagne. 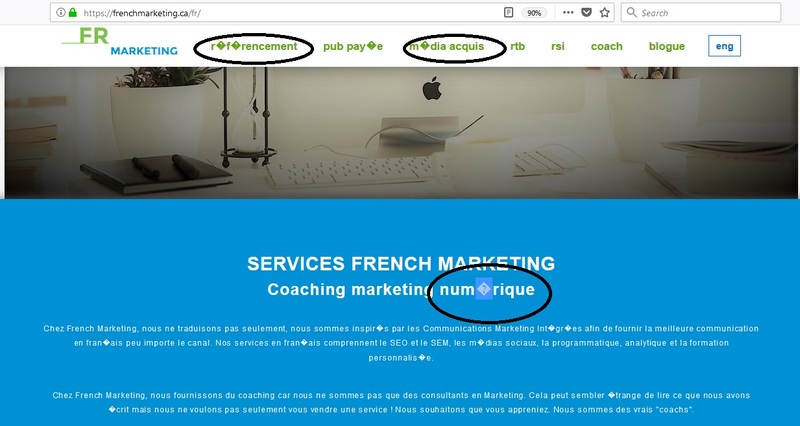 Nous avons donc effectué une recherche en ligne afin de découvrir la demande réelle pour plusieurs mots-clés reliés à French Marketing et l’emploi. Il faut cependant noter que la recherche “Marketing in Französisc” ou “Marketing Französisc” ne représente que 10% de la recherche totale. Nous avons dû séparer notre recherche en fonction de l’intérêt marketing et emploi en français. Il y a peu de recherche pour ces termes mais nous avons pu établir une saisonnalité durant la période de juillet à octobre qui nous laisse croire que cet intérêt survient lors de la saison du tourisme. 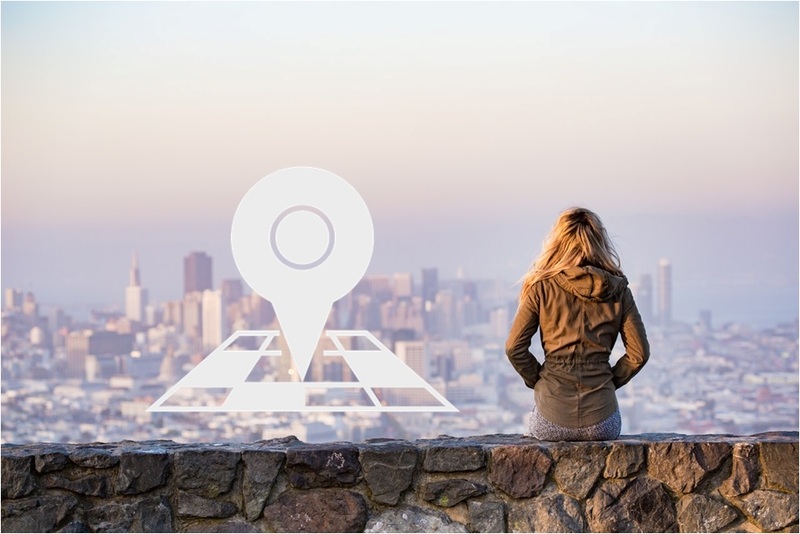 Nous supposons que la recherche pour ces mots-clés et la demande du segment emploi est liée au tourisme surtout quand nous comparons les villes d’où provient la recherche en Allemagne. Vous travaillez en marketing français en Allemagne ? Contactez-nous ! Il nous ferait plaisir d’échanger avec vous au sujet de votre travail et du marketing en français. Why did I lose my French Accents on an HTML Web Page? All the French Accents no longer show up on HTML web page, what happened? You may have included the wrong charset in your meta, declaring the incorrect content-type. Ensure it is indeed listed as UTF-8 meta http-equiv=”content-type” content=”text/html; charset=UTF-8″. 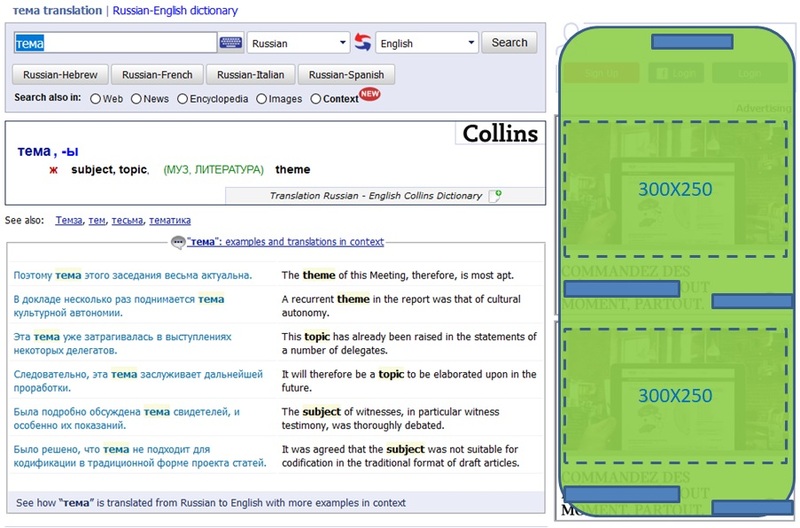 The document type in HTML, listed as “DOCTYPE” is declared to inform the validator which version of HTML to use as it loads the web page in a browser. Using an incorrect version may not support French Accents. If you store your text as ANSI in a Database there is a good chance that it will never render the French Accents – because it can’t! 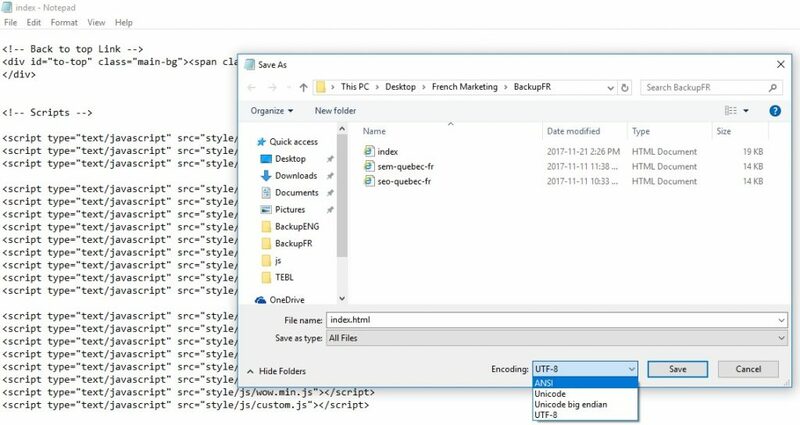 Many hosting plans allow you direct access to your code in a Control Panel (CPanel), it is fast to edit files however don’t forget to save French files as UTF-8. By far this is one of the oldest mistakes in coding HTML for French Web Pages. The reason the French accents disappear is that Text Editors tend to revert back to ANSI files before being saved. Therefore, when you save your HTML file ensure you save it while also encoding it as UTF-8. There are good SEO people and some are not so good. The problem is that SEO is misunderstood and open to a thousand definitions. But the reality is that there is only one true definition of SEO – it works or it does not. When SEO people willfully exploit misunderstanding. Unfortunately, it is easy to fool some Marketing people if they don’t understand SEO. I am sad when I see an SEO person fake their credibility by telling you they rank #1 on Google for USELESS keywords. Some keywords turn out to be useless because NO ONE searches for those words, therefore worthless to you. Let’s say you sell cars. Would you be impressed if an SEO ranks #1 for “Cars for sale”, yes you should be. Should you be impressed if an SEO ranks #1 for “Cars with one blue door for sale”, NO! You see the problem, you instinctively know that NO ONE searches for “Cars with one blue door for sale”. Therefore, the fact that a so-called SEO Pro ranks #1 on Google for that keyword does not mean anything. Some SEO people will deliberately work to reach rank #1 on associated keywords that appear to be very close to your business. 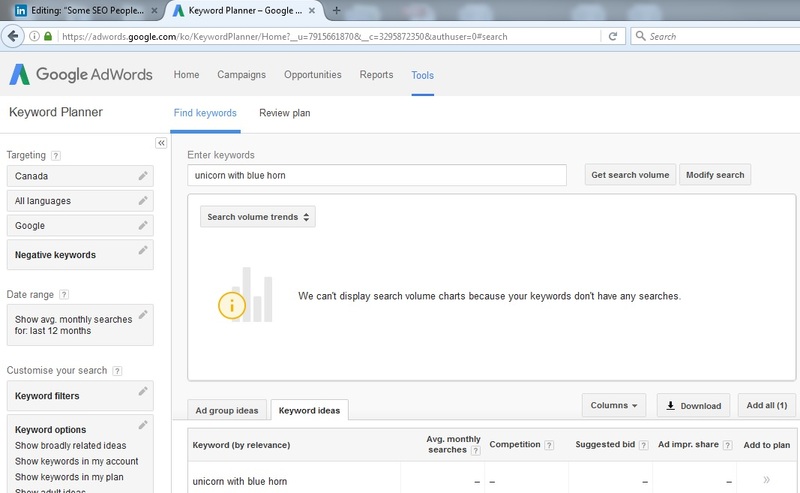 However what they are really doing is ranking on keywords that are related to your category, industry, product WITHOUT using the right words or combination that actual people search. There is NO search volume. It is in fact like ranking for “unicorn with blue horn” – Useless to you and your Brand. The vast majority of us only care about good performance, we have worked hard to gain our knowledge we therefore wish to apply it. In general, we only wish for all clients to succeed. Unfortunately we do need to warn you that not all SEO people care about you or your Brand. Sometimes they even lie. Integrated Marketing Communications (IMC) is a smart aspiration of unifying all Marketing fields, titles and activities. Have you ever encountered any IMC department in a Company or a University made up of only one person? It has become popular to deny that Digital Marketing exists as a field or Title. The notion that Digital Marketing does not exist, and should be avoided as a Title, is tempting yet false for various reasons. So you stopped using the Title Digital Marketing because it allows the simplification of the term “Digital Marketing” by positioning it under the broader term “Marketing” to aid comprehension. Even your grandma and grandpa can understand when you say “I work in Marketing”. But seriously, this is not a valid reason to deny Digital Marketing as a field simply because you fail in explaining your job to family members. Relying on historical events to compare the field such as the moment of mainstream consumer adoption of motor vehicles or electricity. No one called themselves an Electricity VP or a Motorized VP to define their field, right? Wrong. They did, look at Wikipedia you will find historical newspaper documents that prove otherwise. The funniest part of this claim is that some professionals even today have those titles – look it up on LinkedIn! Purists feel justified in stating that no other field feels the need to compartmentalize sub-activities into a Title. Quite the contrary, the only difference is that in Marketing we seem to make a big deal out of it! There are few Doctors that will insist that Nuclear Medicine is simply Medicine. Few Stockbrokers that will deny that Derivatives Trader is just a sub-activity of Stockbroker. How many Lawyers would you say will waste time denying that Constitutional Law as a field exists – can you really imagine any lawyer saying: “No, it’s all just Law”. Ever heard of a Physicist that would deny the title “Quantum” to a fellow Physicist? 4) Will I sound smarter by saying NO to Digital Marketing? I agree this is a good tactic these days, it may make you sound smart, trendy. It is very popular in Digital Marketing to be counterculture and state that you know everything, that is what creates demand for you as an employee or consultant. Perception is reality today especially in Digital Marketing. The epitome of sounding good at something would it not be to deny its very existence and reduce it to a singular notion? That shows that you are the real deal in Digital Marketing, right? Wrong. Let us illustrate by using Analytics. How much notice would you pay to someone stating there are no Analytics, it is all statistics. When we speak of Google Analytics and Performance Dashboards we are really just talking about statistics. Would you be impressed, would that really sound like thought leadership? If so, why? If not, you get the point. Denying that Analytics exist as a profession is similar to state that Digital Marketing does not exist – it is all Marketing simply does not give justice to what Digital is. Competing services in the industry don’t see a difference. Why is Digital Marketing so special? We finally get to the main argument of this article. Few smart Digital Marketing Professionals will objectively tell you that Print Marketing, TV Marketing, OOH Marketing, Radio Marketing do not exist. Are there Digital activities in each of those Marketing fields? Yes! Are each of those fields embracing Digital as a method to advance and complement their offering? Yes! Now why do they need to balance their workforce to infuse some Digital and why are they hiring some Digital people? BECAUSE Digital Marketing exists! The notion that Digital Marketing does not exist is biased and simply ridiculous. As a final example let’s travel back in time to 1885. You are the owner in a Canadian Candle Production factory. Public street electrical lighting has been introduced in many Canadian Cities. You see what electricity is doing to your sales. 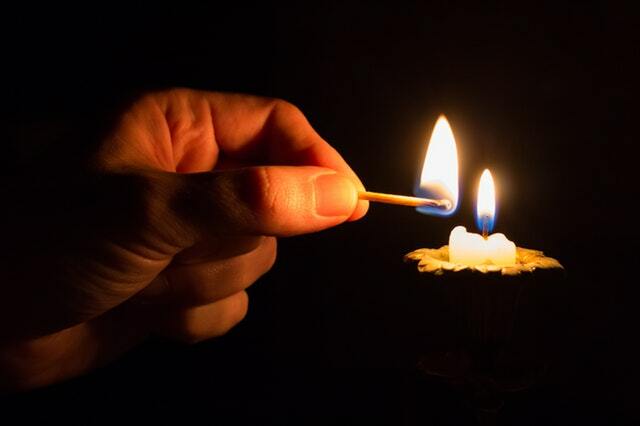 You see the adoption of electricity by consumers to light their homes. You may not want to admit it but can you sincerely state that electricity does not exist as a highly specialized threat to your business? If so, it is plausible that you could easily be tempted to let emotions and self-interest take over thereby denying the legitimacy of your neighbor’s title – VP of Electricity at New Factory Inc. In conclusion, if Lawyers, Doctors, Physicists, Stockbrokers and many other professionals can agree that there exist sub-specializations in their field, all members in the diverse Marketing family should be able to admit the same – without sounding like they do not understand Digital Marketing.